Take a look into our custom-made mantelpieces. 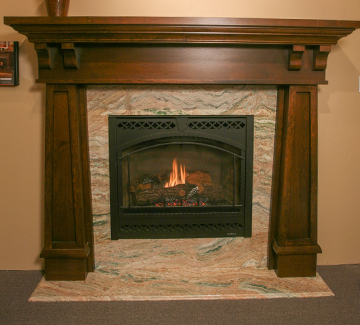 Check out our custom fireplace mantels with a variety of styles and finishes. For more information regarding our mantels call or e-mail us today! Funda-Mantels is a fireplace mantel manufacturer with over 30 years of experience in the fireplace and woodworking industry. Funda-Mantels has the capability and knowledge to bring all of your fireplace mantel design ideas to life, and will expertly attend to all of your individual needs. We pride ourselves in our workmanship as well as our customers' satisfaction. We employ skilled craftsmen and use the finest materials, so you can be proud to say your mantelpiece is Made in the USA! Funda-Mantels has a full line of fireplace mantels from classic, traditional, and vintage to contemporary. Every fireplace mantel ordered is unique. If you want to combine features from different mantels to create your own unique mantel design you can.